This ship was launched (in 1913) as Hamburg America's Admiral von Tirpitz at Vulkan A. G. of Stettin. She was renamed Tirpitz during fitting out, but by the time World War I began, she was still not completed. She remained unfinished until 1919, when she was ceded to Britain as a war reparation and completed. 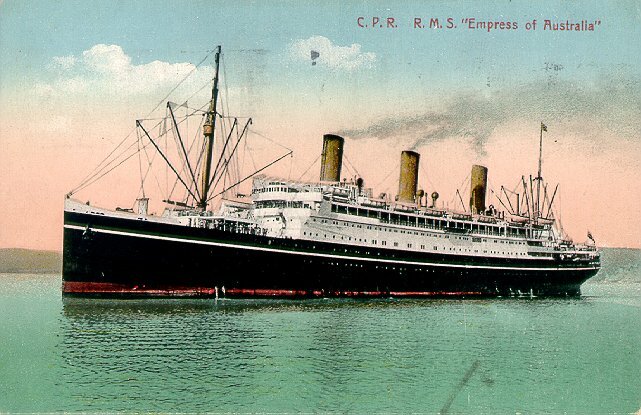 In 1920 she was used as a troop transport, under P&O management, and then was laid up for several months before being sold to Canadian Pacific, which renamed her Empress of China (II). 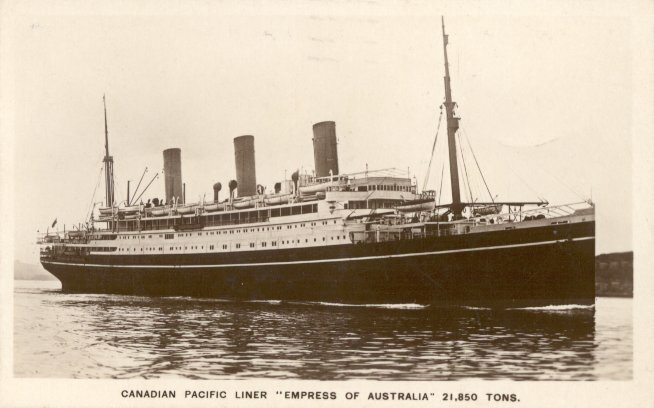 After engine refitting at Vulkan and fitting out at John Brown, she entered Canadian Pacific's transpacific service in June 1922, now called Empress of Australia. In September, after nearly catching fire herself, Empress of Australia rescued some 3,000 residents of Yokohama when an earthquake struck that city. She remained on the Pacific until 1926, when she returned to Glasgow for refitting by Fairfield Shipbuilding and Engineering. After this refitting, she was placed on the express North Atlantic service, and remained there for the balance of her career with Canadian Pacific. Requisitioned as a troop ship in 1939, Empress of Australia never returned to Canadian Pacific. She remained a troop ship until she was broken up in 1952. Sources: Haws' Merchant Fleets; Kludas' Great Passenger Ships of the World.